Many of us develop a fascination for astronomy thanks to simple observation: We look up at the night sky and wonder about what’s out there. Some of us come to astronomy thanks to science fiction, which sparks an interest in far-off galaxies and space exploration. And some of us catch a glimpse of astrophotography and can’t forget those stunning star trails or that crisp image of the Milky way. There’s something so fundamental and human about the sense of awe and wonder that planets, stars, moons, and nebulae inspire in us. It’s natural to want to learn more. So, how do you actually do astronomy? How do you find and observe celestial bodies? It comes down to three big questions: What, when, and where. Where should you look? It’s one thing to know, intellectually, that Mars is supposed to be bright tonight, but that knowledge doesn’t amount to much if you don’t know where to point your telescope. This guide breaks down the What, When, and Where for you. It explains what planets are visible tonight and helps you figure out how to locate celestial bodies. First, I give a list of highlights for 2019: Eclipses, meteor showers, conjunctions, transits, and so on. These events only happen on specific dates, so plan ahead to see them. Next, I discuss each planet and its visibility throughout the year. When is Jupiter visible in the morning sky, and when in the evening? Which direction should you look to find Mercury? When will Venus be completely invisible? I cover all that in this section (and I also give some love to Pluto at the end). Then, I discuss the phases of the Moon and how that affects your stargazing, and I briefly go over finderscopes, a tool that will help you locate things if you’re using a telescope. In the final section I’ll point you to some of the more popular astronomy resources that can help acquaint you with the night sky and keep you in the know about what’s visible. 2019 is already underway, so let’s get started! Note: The planets visible tonight depend on your own location. Where possible throughout this guide, I specify where you need to be to see various events, eclipses, etc. Dates and times also vary depending on your time zone, so make sure to double-check times for any event you’re hoping to observe. January 20-21, nighttime, total lunar eclipse (blood moon): This incredible sight will be most visible to people in North and South America. The Moon will take on a coppery, reddish color as it moves into the shadow of the Earth. You can enjoy lunar eclipses without any special eye protection (as opposed to solar eclipses, which necessitate precautions). July 2, before sunset, total solar eclipse: In a total solar eclipse, the Moon transits between the Earth and Sun, completing blotting out view of the Sun and blocking its light. This eclipse will be visible in a small band across Chile and Argentina. It is the only total solar eclipse of 2019. July 16-17, partial lunar eclipse: In a partial lunar eclipse, part of the Moon (rather than all of it) enters the shadow of the Earth. You have a chance of seeing this one if you’re in South America, Europe, Africa, much of Asia, or Australia. 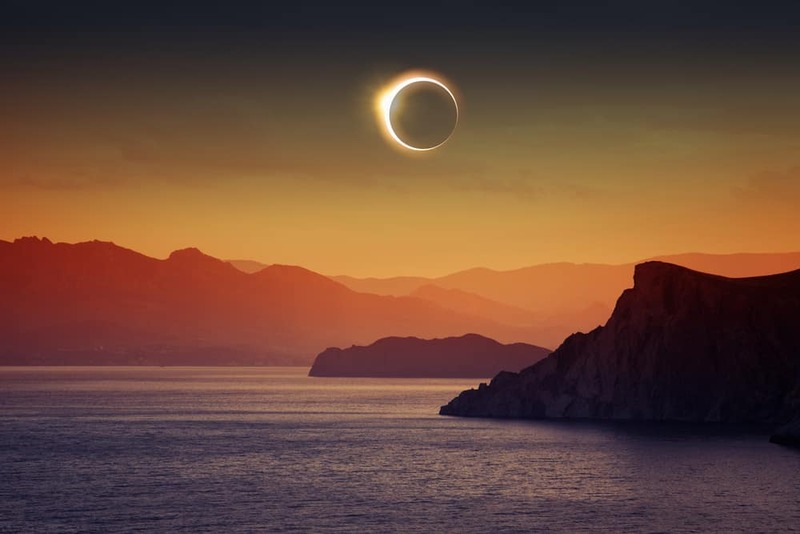 December 26, annular solar eclipse: In an annular solar eclipse, the Moon travels in between the Earth and Sun but does not completely block the Sun. Instead, it creates a dramatic image in which Sun shines like a halo around the edges of the dark Moon. This eclipse will be visible in a path across parts of Oman, southern India, Sri Lanka, and Indonesia. April 22-23, Lyrids: This annual meteor shower will run for about ten days total, with 22 and 23 April supplying the best opportunities. At its apex, it may produce around 20 meteors per hour. Head to a dark place after midnight to try to spot meteors. May 4-6, Eta Aquarids: This incredible meteor shower (around 60 meteors per hour at peak) will appear to its best advantage in the Southern Hemisphere, though it should also be visible in the North. When to head outside and watch? The pre-dawn hours of May 5 are expected to be optimal, though you may also see meteors on the days before and after the 5th. June 7-8, Daytime Arietids: This meteor shower will be ongoing from around May 14 to June 24, but its expected peak is on June 8. July 28-29, Delta Aquarids: Another annual meteor shower, the Delta Aquarids have up to 20 meteors per hour at their best. August 12-13, Perseids: The Perseids constitute one of the best-known and most enjoyable meteor showers. Unfortunately, in 2019, their peak will occur just before a Full Moon so the abundance of moonlight will lead to dimmer and less optimal views. 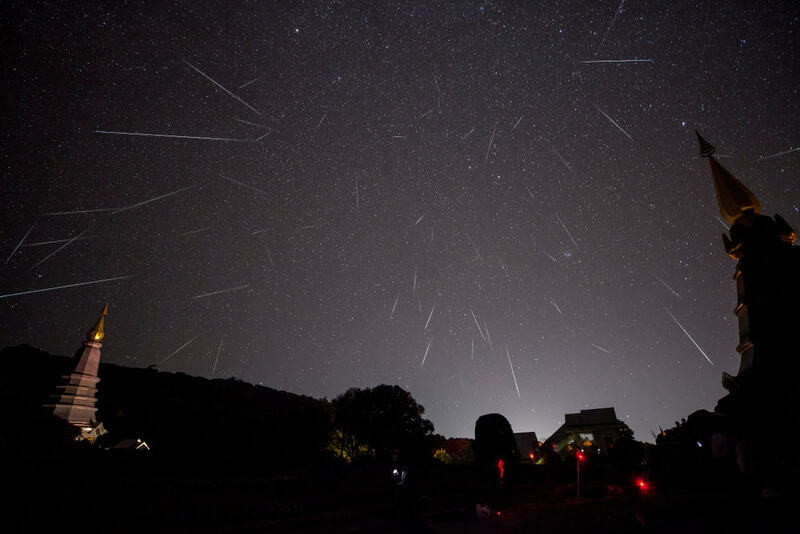 December 13-14, Geminids: This awesome annual shower can produce up to 120 meteors per hour! Unfortunately, like the Perseids, the Geminids also peak around the time of a Full Moon in 2019, which may reduce visibility. December 22-23, Ursids: Meteors will appear between December 17 and 26, reaching their peak on December 23. For a super detailed (and somewhat technical) guide to 2019 meteor showers, check out the International Meteor Organization’s 2019 Meteor Shower Calendar. January 22, pre-dawn, Conjunction of Venus and Jupiter: In the early, early morning hours, look to the east to view Venus and Jupiter as they appear close together in the sky. (Of course, they’re not actually located super close to each other, but from the vantage point of Earth, they appear in close proximity and can be viewed together). June 10, Jupiter at Opposition: Jupiter will come relatively close to Earth and appear bright in the sky, visible throughout the night. For instance, from Helena, Montana, Jupiter will be visible between 10:07pm on June 10 and 4:44am on June 11. I suggest checking In-The-Sky to get precise timings for your location. This is the ideal time to observe Jupiter, including details such as its cloud bands (viewable via telescope). A pair of binoculars should help you see four of Jupiter’s moons. June 19, evening, Conjunction of Mercury and Mars: These two planets will appear close together in the night sky. If you have a telescope, you should be able to observe both in the same field of view. The conjunction should also be visible with a pair of binoculars, or simply with the naked eye. July 9, Saturn at Opposition: Saturn will appear closer and brighter than usual. Take advantage of this opportunity to view Saturn, admire its rings, and photograph it. September 10, Neptune at Opposition: Now it’s Neptune’s turn to take center stage and remain visible throughout much of the night. Grab your telescope to observe the magnificent deep blue planet. October 28, Uranus at Opposition: Uranus is so far away that you can’t see it well with the naked eye, and basic telescopes will struggle to show you much more than a tiny bluish-green dot. However, if you want to see this distant planet, October 28 is your best bet. It will appear all night, closer and brighter than usual. November 11-12, Mercury Transit: A transit of Mercury occurs when the planet travels between Earth and the Sun and is briefly silhouetted against the Sun. The transit this year is expected to take about five and a half hours. You may be able to observe it if you’re located in North or South America, Europe, Africa, or western Asia. This is an event to prioritize, since it’s quite rare and isn’t expected to happen again for over a decade. November 24, Conjunction of Venus and Jupiter: Once the sun sets, look west to spot these two planets shining brightly close together in the night sky. This is just a sampler of the many exciting astronomical events that you can observe this year. For a more complete list of conjunctions that will occur in 2019, check here. For a longer list of 2019 oppositions, visit the page here. In the next section, I’ll discuss each planet, one by one, and offer some tips on when and how to view them at their best. And Honorable Mention goes to Earth, which is certainly visible but not really the point here. What about the so-called outer planets, Uranus and Neptune? At times, they might be just visible with the naked eye, but they’ll look identical to stars. To appreciate these planets, you need a good pair of binoculars or a telescope. Now, I’ll go through each planet in turn and explain when you’ll have the best observing conditions. If you want a quick reference for later, check out this chart, which indicates, at a glance, whether a particular planet is visible on a given morning or night. Bear in mind, however, that charts like this one are broken down by month—so, what if Planet X is visible for half of the month? Or only a few days? In those cases, you’ll need to consult a more detailed guide for precise dates! Mercury is a relatively small planet, but it’s still often visible. What does it look like? With the naked eye, it appears similar to a bright star with a yellowish or earthy color. February 18 to March 5, in the evening: This is the best time to view Mercury in the evening. On February 27, it will reach its greatest eastern elongation, which offers optimal chances for viewing, especially for people in the Northern Hemisphere. March 23 to May 7, in the morning. June 3 to July 11, in the evening. On June 19, you can get two for the price of one with the conjunction of Mercury and Mars; the two planets will look close together in the sky. August 1 to August 19, in the morning. September 23 to November 3, in the evening. On October 20, Mercury is at its greatest eastern elongation. October is the best time to view Mercury from the Southern Hemisphere. November 11: Transit of Mercury. This is a rare occurrence in which you can see Mercury silhouetted against the backdrop of the Sun. (Note: Looking at the Sun is dangerous and can permanently damage your vision, so take proper precautions!) It will be visible in (most of) North and South America, Europe, western Asia, and even Antarctica. November 19 to December 13, in the morning: This is generally the best time for viewing in the morning. On November 28, Mercury reaches its greatest western elongation. Before dawn, look for Mercury in the eastern sky. 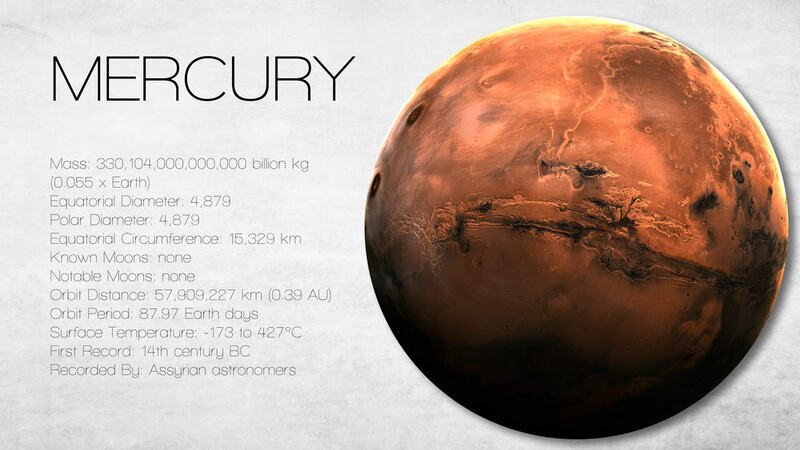 Mercury is small, speedy, and close to the Sun, and it can be very tricky to locate. For one thing, Mercury tends to appear low on the horizon. So if you’re surrounded by buildings, your view of Mercury will likely be blocked. Your first step is to get outside and up a hill, ideally in a nice field without tons of trees to block your views of the horizon. Another complication: Mercury does not remain visible all night long, so you don’t have tons of time to look for it. It is either visible just before sunrise or just after sunset. You should have about an hour-long window either pre-dawn or post-dusk in which to find Mercury. This adds the challenge of looking for Mercury in slightly brighter skies rather than in total darkness. But with some luck and preparation, you should be able to locate it. Where should you look? Remember that Mercury is close to the Sun. Let’s say you’re looking for Mercury in late February, when it will appear in the evening (post-dusk) sky. The Sun sets in the west, and Mercury will appear in the west as well. What if you’re searching for Mercury in late November, when it appears in the morning (pre-dawn) sky? The Sun rises in the east, and Mercury will appear in the east too. February 27: greatest eastern elongation (view in western sky after sunset). 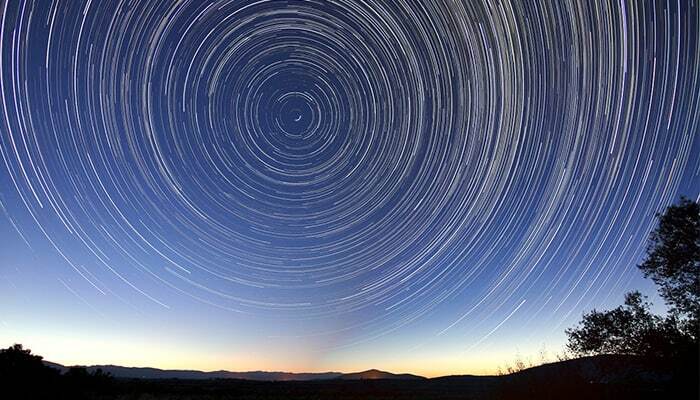 April 11: greatest western elongation (view in eastern sky before sunrise). June 23: greatest eastern elongation. August 9: greatest western elongation. October 20: greatest eastern elongation. November 28: greatest western elongation. These dates give you the best chances for viewing Mercury. For even more detail and guidance, check out the Mercury Chaser’s Calculator, which lets you enter any year to find out when Mercury’s maximum elongations will be (or were). Finally, a warning: Take care during your search for Mercury—due to its close proximity to the Sun, there’s a risk of accidentally looking directly at the Sun instead, which is dangerous and inadvisable. 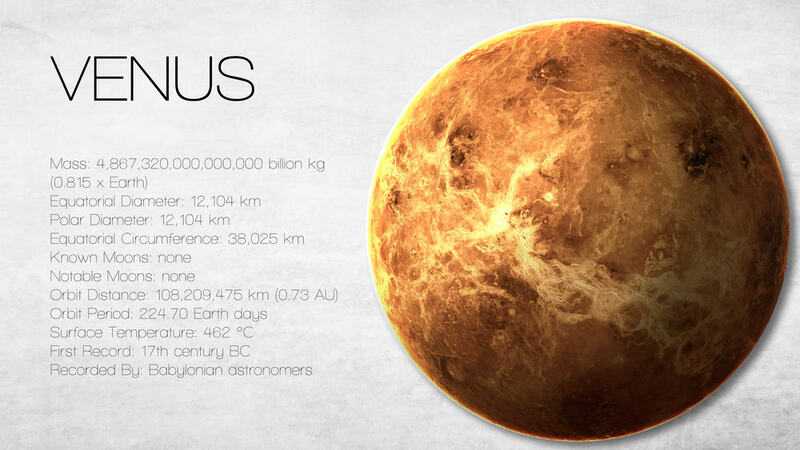 Named for the goddess of love, Venus is about the same size as the earth, but it’s otherwise incredibly different and distinctive. It has a volcanic landscape and is covered in acidic clouds. The planet’s surface reaches temperatures of 900oF (465oC)—not exactly hospitable to human life! January 1 to June 19. Look to the east early in the morning. October 10 to December 31. Look west in the evening. 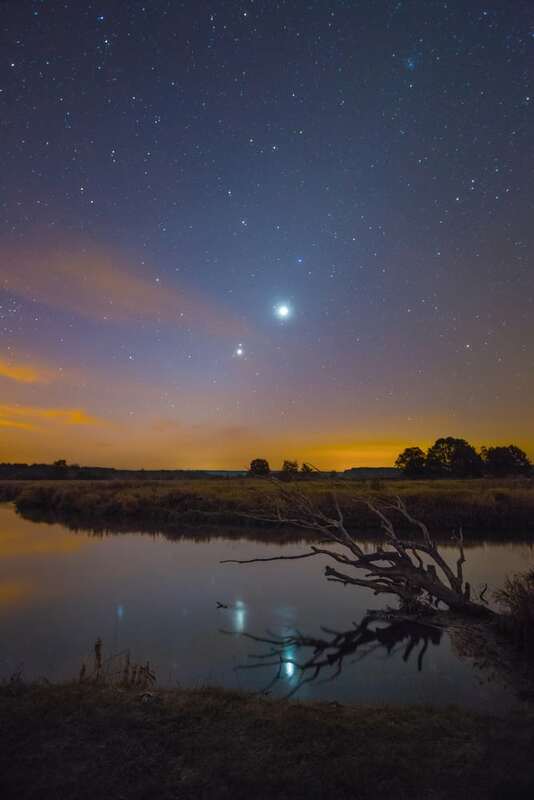 On November 24, keep an eye out for the conjunction of Venus and Jupiter. Venus is one of the brighter objects visible in the sky, which should help you locate it even without the assistance of a telescope. In fact, you can even spot Venus during the day. Similar to Mercury, it tends to appear either in the morning (before sunrise) or evening (after sunset) rather than throughout the night or at midnight. You have a slightly longer window of time in which to find Venus, however, since it is further from the Sun. The benefit of this: You can search for Venus while the sky is dark. Also like Mercury, Venus tends to stay quite close to the horizon line. When it appears in the morning, it can be found in the east (like the rising Sun); when it appears in the evening, it is found in the west (like the setting Sun). Finally, Venus appears to have phases like the Moon. Once you find it, you can take note of the planet’s current phase. Mars is famous for its rugged reddish landscape which gains its color from iron minerals in the soil. It’s also famous for the human fascination with someday colonizing it, encouraged by films like The Martian. 2018 was a superb year for viewing Mars, and 2019 may seem underwhelming in comparison. But don’t worry, you can still get some views of the Red Planet. 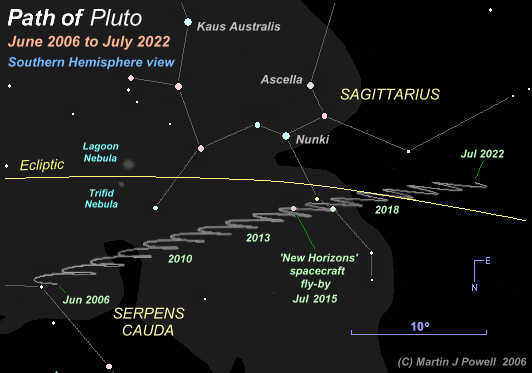 January 1 to July 18, in the night sky. Mars will appear brightest at the beginning of the year and then grow dimmer. On February 13, you have the chance to view Mars and Uranus in close proximity, and remember that on June 18, you can observe the conjunction of Mercury and Mars as they appear close together in night sky. October 16 to December 31, in the morning sky. If you’re interested in finding Mars in 2019, I strongly recommend this description of its movements throughout the year. 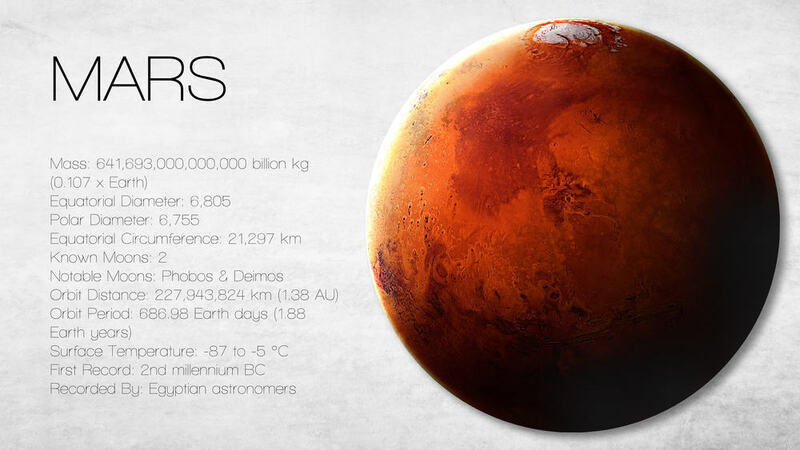 You can locate Mars by researching where it is located in relation to constellations. Use a star chart to orient yourself in the night sky, learn where constellations are, and use them as landmarks to find Mars. During this time, Mars is visible in the night sky. In late July, Mars will disappear from our view, before reappearing in the morning sky in the fall. 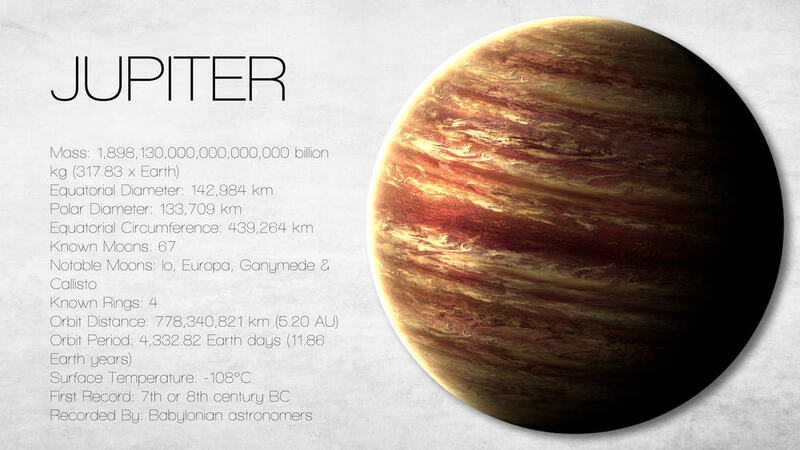 The largest planet in our solar system, Jupiter and its many moons have been impressing astronomers since Antiquity. Its famous Red Spot may look tranquil from a distance, but it is in fact a massive storm that has lasted for over a century. January to June 9, in the morning sky. On January 22, keep your eyes peeled for the conjunction of Venus and Jupiter. June 10 to November, in the evening sky. Note that on June 10, Jupiter will be at opposition to the Sun and will therefore be visible all night. On November 24, you have another chance to view the conjunction of Venus and Jupiter. Jupiter is one of the brightest objects in the night sky, ranking just behind the Moon and Venus. You can see it with the naked eye, though you’ll of course have better views through binoculars or a telescope. Check out Naked Eye Planets for a super-detailed description of when and where Jupiter will be visible in the night sky during 2019. The best views of Jupiter will occur on June 10 when it reaches opposition to the Sun. This means that it is relatively bright and close to the Earth, as well as visible all night. If you have a telescope, challenge yourself to find not only the planet itself but also its details and features. Can you find its largest moons? Its gas bands? Its famous great Red Spot? This ringed planet has inspired countless people to fall in love with astronomy. 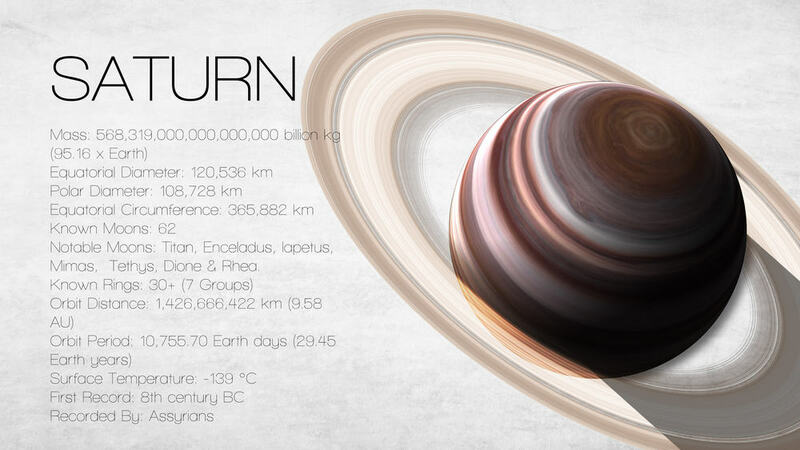 Did you know that Saturn is losing its rings though? Don’t worry: You still have about 100 million years to see and appreciate them! January 18 to July 8, in the morning sky. July 9 to December 28, in the evening sky. Saturn reaches opposition to the Sun on July 9 and will be visible all night, providing ideal viewing conditions. On the night of July 16-17, you can see Saturn and the full Moon together. Brightest between June 29 and July 22. Note that the relative positions of the Moon and Saturn, as well as the precise timing of this occurrence, will depend somewhat on your own location on Earth. 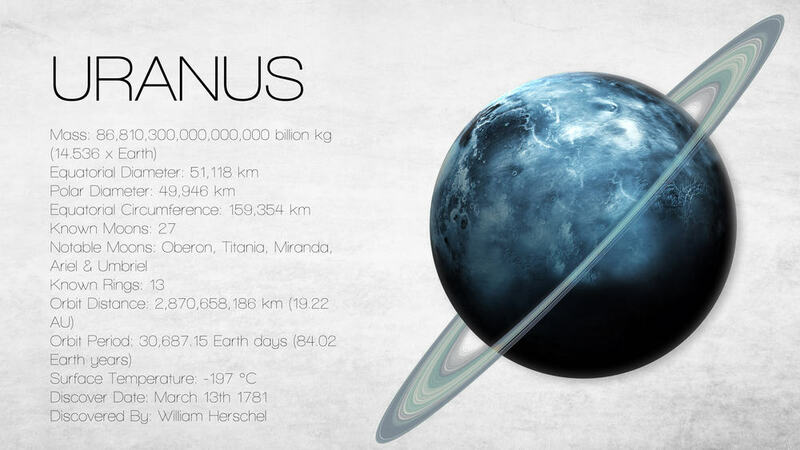 Uranus is an ice giant, meaning that it comprises a rocky core covered by an “icy” mass of water, ammonia, and methane. Like Saturn, Uranus has rings, and it also has 27 moons (that we know of!). Uranus is also quite large, around four times wider than Earth. January 1 to April 5, in the evening sky. You can view Uranus and Mars together on February 13 (Mars will be the brightest of the two by far). May 9 to October 27, in the morning sky. Venus and Uranus will appear close together on May 18 (with Venus as the brighter of the pair). Conjunctions provide excellent opportunities to find the elusive Uranus, since you can use the nearby brighter planet, Mars or Venus, as an anchor for your search. October 28 to December 31, in the evening sky. Uranus reaches opposition to the Sun (and is therefore in prime viewing conditions) on October 28. Brightest from August 21 until the end of the year. One strategy for finding Uranus is to wait until it appears in conjunction with other, brighter planets. These conjunctions will occur on February 13 (with Mars, best seen from the Northern Hemisphere) and May 18 (with Venus, visible from the Southern Hemisphere). Once you’ve spotted Mars or Venus, you’ll know that Uranus can’t be far. I also recommend consulting this handy Uranus Finder Chart, which traces the path of Uranus along the ecliptic. You can also find printable finder charts for Uranus at this page. Like Uranus, Neptune is an ice giant with a gassy atmosphere of molecular hydrogen, atomic helium, and methane. 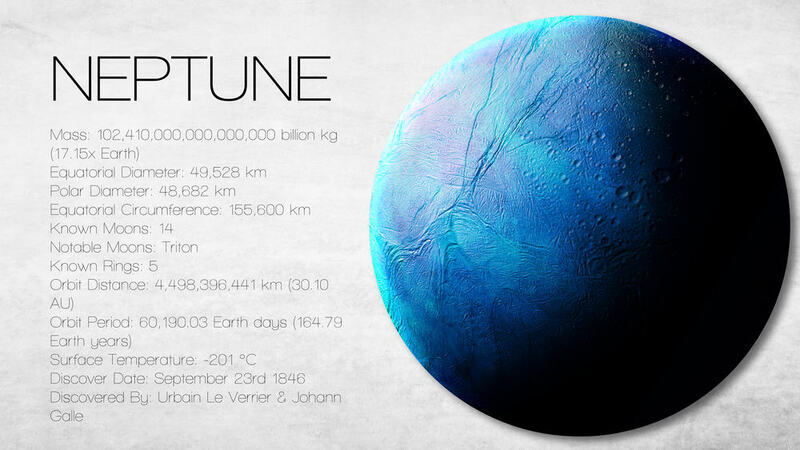 What sets Neptune apart? For one thing, it’s the windiest planet in our solar system. These high winds propel frozen methane clouds across Neptune at 1200+ miles per hour (2000+ kilometers per hour). You’ll need a telescope or a solid pair of binoculars to observe Neptune—and in my experience, it’s definitely worth it! 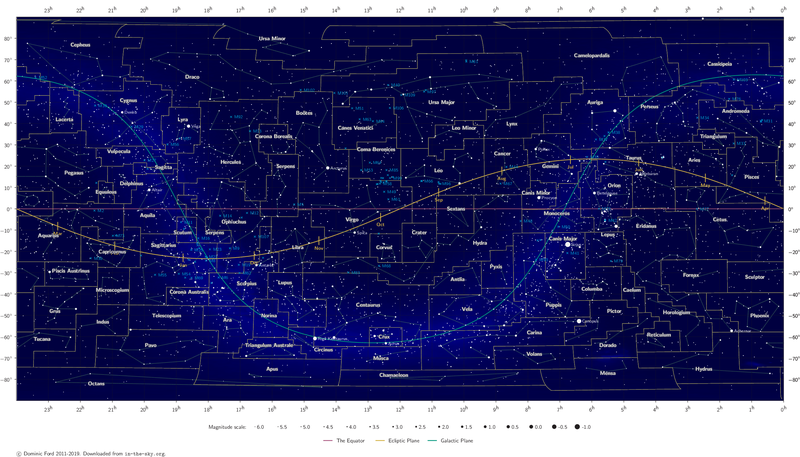 January 1 to February 19, in the evening sky. March 23 to September 9, in the morning sky. View Neptune and Venus as they appear close together on April 10. September 10 to December 31, in the evening sky. As you can see, Neptune will be visible for much of 2019, though it will be brightest between July 15 and November 4. It reaches opposition on September 10; weather permitting, this will be the best viewing opportunity. Take a look at the star maps here (Northern Hemisphere) and here (Southern Hemisphere) to get a general sense of Neptune’s position in the sky, from 2006 to 2023. 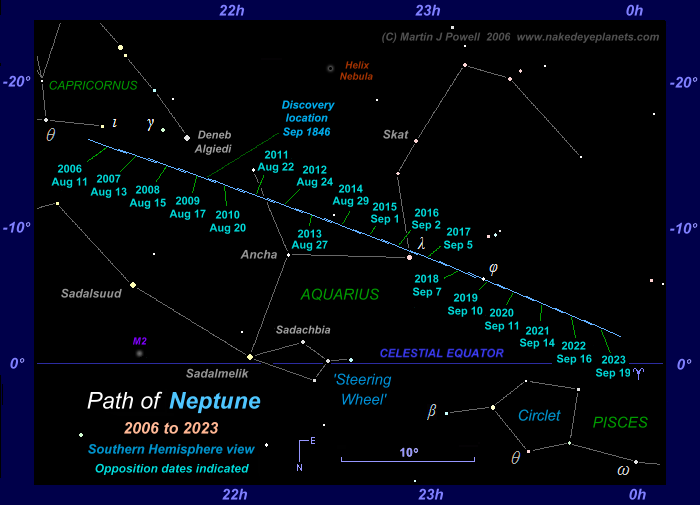 Then, use this finder chart (or this one, for the Southern Hemisphere) for more specific help with locating Neptune in 2019. You can also find printable finder charts for Neptune here. 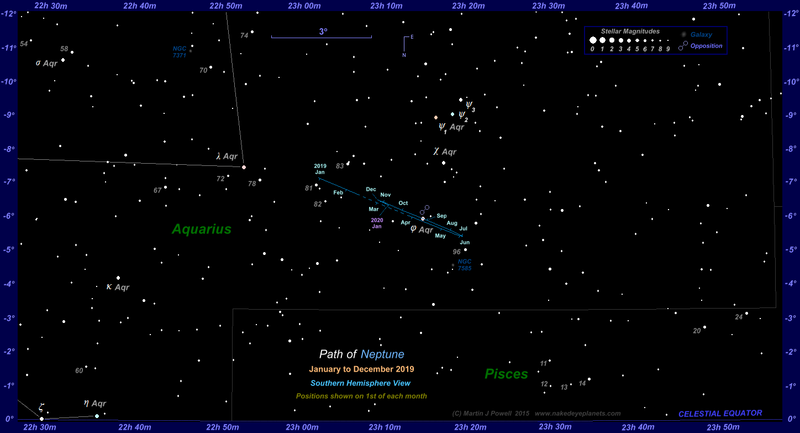 This year, Neptune will appear in the eastern part of Aquarius. Neptune will be in conjunction with Venus on April 10; this conjunction is best seen from the Southern Hemisphere. You’ll be able to use the brighter planet Venus to help you locate Neptune nearby. Pluto’s status as a planet may be up for debate, but regardless of how it’s classified, it’s still a pretty fascinating object. It’s an icy world located in the Kuiper Belt and has five known moons. 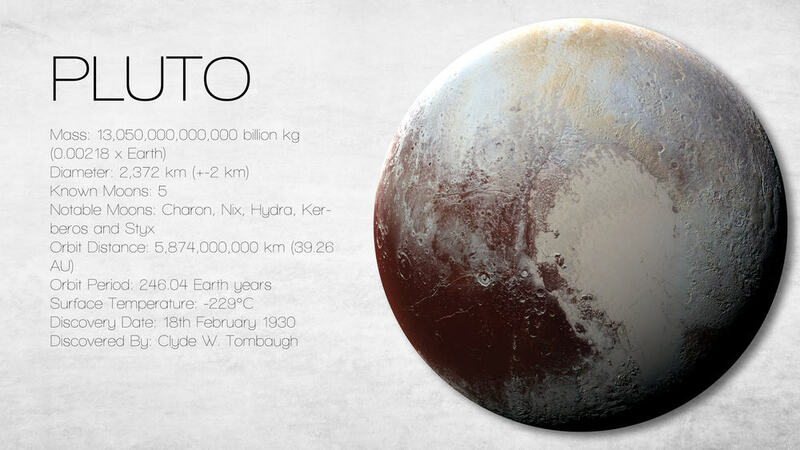 Pluto is too tiny to see with the naked eye. You’ll need a fairly powerful telescope and some dark skies to get a view of it. Pluto will be at opposition on July 14, 2019, which is, depending on weather conditions, the best date for observing. You can use the star maps here (Northern Hemisphere) and here (Southern Hemisphere) to figure out Pluto’s location in the night sky. I tend to keep track of when the next New Moon will occur. It’s important information that helps me plan some of my stargazing. So, why pay attention to when the New Moon is? Doesn’t that just mean that you can’t see the Moon in the night sky at all? Yes, and that’s the point. The night of a New Moon (or the nights just before/after) is an excellent time to try observing dim, deep-sky objects such as star clusters and galaxies. Without the presence of moonlight, the sky is darker, and you have the chance to spot faint objects. So if you hope to view dim, distant galaxies or nebulae, you’ll need to know the date of the next New Moon, so you can observe without any interfering moonlight. As I mentioned up above, excess moonlight can put a damper on some viewing opportunities. Both the Perseid and Geminid meteor showers in 2019 are due to peak shortly before or after a Full Moon, which means that they won’t be as spectacular as they could be this year. On the other hand, the Moon is awesome in its own right! many astronomers enjoy observing the Moon and are hoping to catch it when it’s full. You may also be interested in viewing lunar eclipses or using the bright Moon to locate harder-to-find objects such as Saturn. So, each phase of the Moon has its advantages and disadvantages, and it all depends on your personal goals. In any case, you should have a basic awareness of the phases of the Moon. You can use websites like Moon Giant to keep track of the phases of the Moon. Moon Giant also provides Moon calendars, lets you virtually explore the surface of the Moon, and has a gallery of vintage NASA pictures. You can see a lot with just your eyes or with a good pair of binoculars. However, planets such as Neptune or Uranus are best viewed with a telescope. 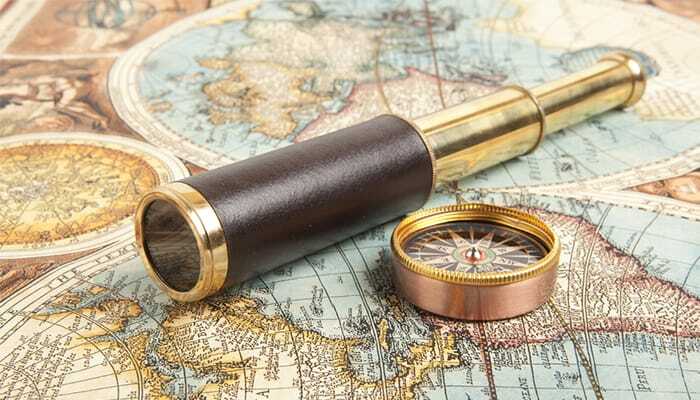 Your telescope probably comes with some sort of finderscope, which helps you locate specific objects in the night sky. Finderscopes have a wider field of vision; they show more of the night sky (at a lower magnification) than your telescope. This wider view helps you find things more easily. Of course, you still need to have a general idea of where to look. Center your finderscope on your target. If your finderscope is properly aligned, then this target should show up in your telescope’s eyepiece. If you’re having trouble with your finderscope, there are numerous video tutorials available to help you troubleshoot. Or, if you belong to as astronomy club, you can ask for help from more experienced members. This site contains a wealth of information on the night sky. One of its best features is “Objects in your sky: sky diagram.” It detects your location (or you can input whatever location, date, and time you want) and tells you what’s up in the sky on that date, in that place. So, for instance, it might tell you that in your current location, Jupiter will be visible in the dawn sky at 4:24am, rising to 20o above the southeastern horizon before fading from view as the sun rises at 6:56am. This program will even tell you about galaxies, clusters, comets, and asteroids in addition to the Moon and planets. Also head to this page, which runs down the list of planet visibility from your location on a given date. The EarthSky website as a whole contains seemingly endless information—it’s easy to get lost down the rabbit hole! For our purposes, their section on “Tonight” is a great way to stay up-to-date on what’s visible. You can click through week by week to see upcoming highlights like meteor showers or conjunctions. 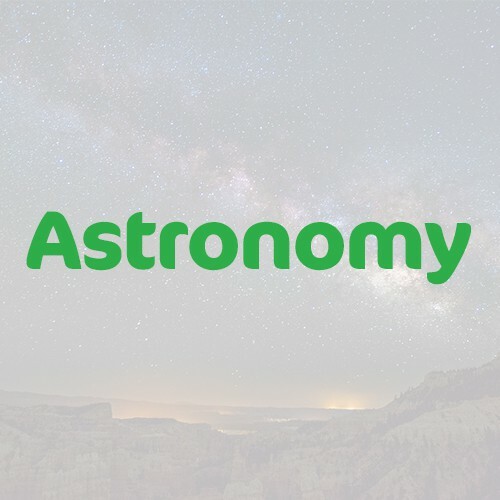 This online planetarium program shows you a realistic sky with prominent objects labeled (such as the Moon, the planets, and stars such as Deneb, Vega, Pollux, and Betelgeuse). It helps you get acquainted with the sky and the positions of the constellations. Plus, this virtual sky corresponds with the sky in your particular location—either use auto-location, or input a location. You can use Stellarium’s online planetarium to check on what’s visible and then step outside to see the same sky in real life. Stellarium also provides a list of what planets are visible on a given night. I’ve just checked it for my location tonight: The results? Mercury, Venus, Mars, Jupiter, and Saturn are all visible tonight within specific timeframes. 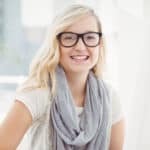 This website has a useful section on “Observing,” which supplies regular updates on what is visible each week, along with some pointers for locating things. 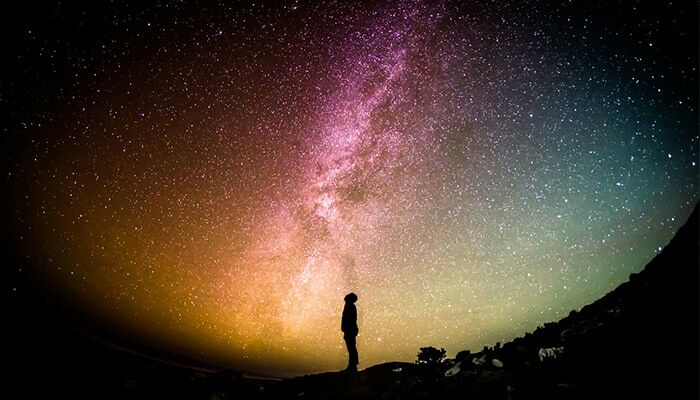 There’s an impressive archive of articles on getting familiar with the night sky, from how to choose an observation site to how to find your way around a star chart. You can also subscribe to Astronomy magazine, which runs a “Sky this Month” column. I hope this guide helps you make the most of your 2019 stargazing! The night sky is set to put on a fabulous show this year, and with a little planning, you can watch. Try your hand at finding the planets, get your friends together to view an eclipse, or chill out in a camp chair as you watch a meteor shower. What are you most looking forward to observing this year? Hey I’m Jenny! Thanks for checking out my guide to visible planets! 😀 If you’re looking for a hobby that’ll give you a feeling of awe, appreciation and insignificance all at the same time, Astronomy is for you!